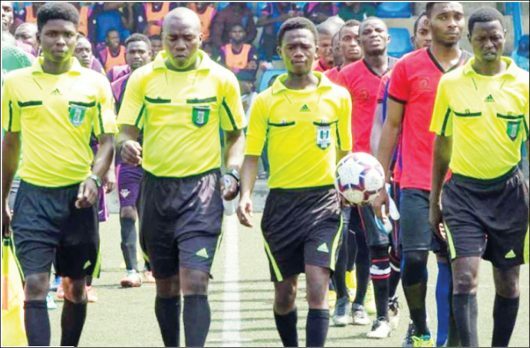 The president of the Nigeria Referees Association (NRA), Tade Azeez, has insisted the body will take the necessary steps to enforce its ‘zero tolerance’ towards corruption. “We have issued a statement to that effect, the NRA will come out with verdicts after an appropriate investigation,” Azeez said. “The NRA wishes to state that it is deeply committed to the growth of Nigeria football as it has charged referees to operate within the confines of the League Management Committee laws and regulations by adhering strictly to accommodation and feeding procedures allowed,” the association said. “It is sad that because the match officials failed to favour the home side, they were thus attacked. This is the reason why the NRA president Tade Azeez said good officiating is hard to find in Nigerian leagues because home teams want to win at all cost. However, the media officer for Sunshine, Chris Okunnuwa, denied the attack but admitted that a fan threw an object at the referee which may have wounded him. “Honestly the referees were not attacked or assaulted physically; there was no way that would have happened anyway due to the heavy security presence on ground for the Sunshine Stars Kano Pillars game. “But truly a water object was thrown from the crowd towards the officials on their way to the dressing room after the game and that could have caught the injured official. I know the club won’t shy away from taken responsibility for this. “Shame it appeared the way it is already but in truth the referees were not assaulted save for the object thrown by a spectator in the crowd and last time I checked serious efforts were already on to fish out the object thrower and bring him to book. The League Management Company will be banking on the official report from its Match Commissioner to take an informed decision on this latest saga.